Question: Can we configure SharePoint with local user account? Answer: Most of the time I heard answer NO. Yes the answer is right while going with SharePoint Configuration UI (User Interface -> SharePoint 2010 Products Configuration Wizard Window). Because, It contains validator to check either user is from domain account or is of local user and then it throws error. So most of the time user configure its SharePoint as standalone type where it doesn't ask for domain user. I decided to go with Complete installation and with local user account (Actually my machine is in workgroup not in domain so I had no choice). After SharePoint installation, open SharePoint Management Shell (SharePoint PowerShell editor). You will get following error:- The Local Farm Is Not Accessible". Don't worry about this. This message is coming because SharePoint is yet not configured at your machine. 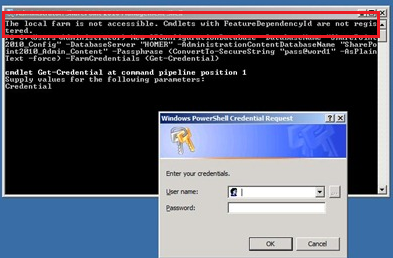 the above message will prompt for windows credential (as shown above). Here just pass your local user name and password (Please make sure, this user must have DB owner permission in SQL as shown below). Please note:- This is not recommended by Microsoft and also please don't use on Production Server.